Posting engaging content on a daily basis is no small task! Often times, the best way to consistently post great content is, not surprisingly, to start with great content! So how do you come up with all that great content? 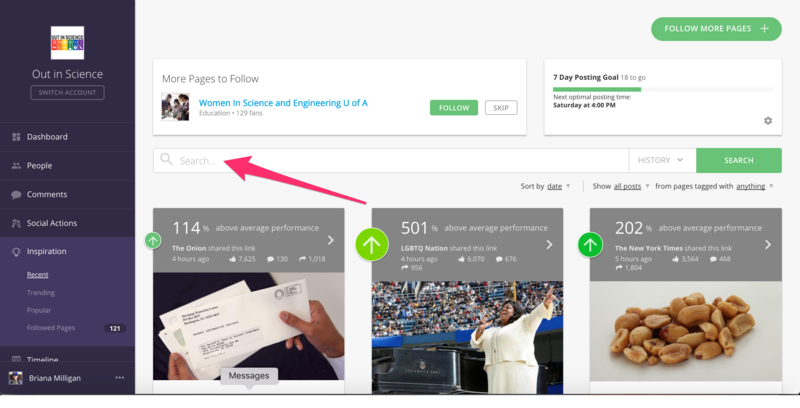 Your ActionSprout Inspiration tab features recent over-performing content from any pages you've asked the tool to follow. It's important to look at the activity and quality of the Page’s content, too. Pages that rarely post or post low quality content are of little value to you. 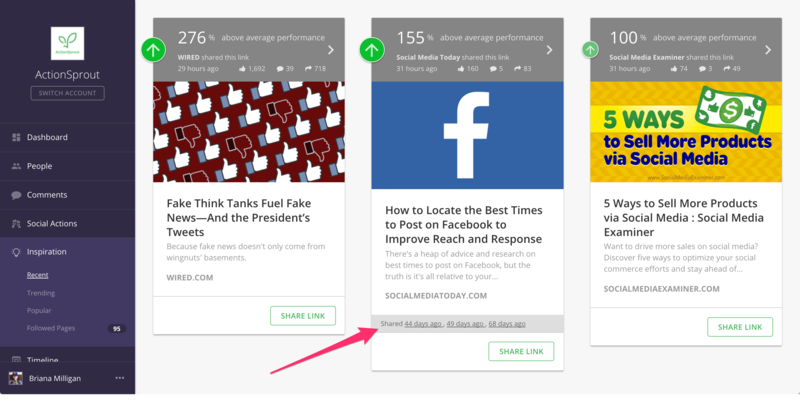 When you find a post you'd like to share on your Page, just click the Share button. This will open a menu in the right of your screen. Here you can draft your message and choose a time to schedule the post to your Page. Make sure to pay attention to the Recommended Post Times. These are unique to your Facebook Page and audience and predict when most of your followers will be on Facebook again. Posting at these times means more reach and engagement for free! At the top of each content card you'll find the percentage that the piece of content over-performed in terms of post engagement. (Reactions, comments, shares, clicks, views, etc.) This is based on the Page’s unique average engagement per post, with the average always being 100%. Only content that engages more people than average will be displayed in Inspirational. Next you'll find a thumbnail of the piece of content as it appeared on Facebook. This details specifics on the type of Facebook engagement that each piece of content received. Pay close attention to these numbers. A piece of content could be over-performing by 200% even though it only received a few likes and comments. This merely reflects that this page normally has a low average engagement. Keeping all numbers in mind can help give you that larger picture, so you can better choose what to share on your own page. Has It Been Shared Before? You'll see each time the post was shared along with a direct link back to those posts. Please note: Only exact link matches will be labeled as "Shared." For example, two Bit.ly links to the same campaign will be recognized as two different links, even though they point to the same content. This may be one of the more powerful features of our Inspiration tool! In the Search box at the top, type in keywords for the types of content you're looking for. This will immediately bring up the highest performing content on those subjects. Easy as that! If you don’t find the content you where hoping for, or want to see more results, try following more pages that post that kind of content your supporters would appreciate. You can choose to filter your feed by Content Type, too, if particular kinds of content (like images or videos) tend to perform well on your page. Simply choose the type of content you'd like to filter your results by, and you'l see all the top performing posts of that kind from all the pages you're following. No more scouring results for exactly what you want. We serve it right up to you! When browsing through your Inspiration feed, get in the habit of looking for patterns. These provide tell-tale signs as to what your supporters would like to engage with. For example, if you notice most of the high-performing content is images and articles, that's a clear indication that your supporters would like more images and articles over other pieces of content. Give your supporters what they want to increase your audience's engagement. What types of content are mostly bubbling up? Images? Videos? Articles? Status updates? It may be just one or a few. Figure out which is dominant, so you can continue that trend and meet your audiences needs. Another way to think about format is the way the content is presented or framed. Is the content framed as a story? An action? A study or recent finding? Is it all about presenting the facts? Or does it ask questions and open up discussion? Long versus short content can make a difference as well. Crafting your content to meet your audience's favorite format type is a guaranteed way to boost engagement and reach. Format aside, what kinds of content do well. If the winning content format is images, for instance, what are the images of? Nature? People? Do they include text? If it’s articles, which of those are top performing? Is there a pattern in the subject matter? There usually will be a few subject matter that your supporters enjoy over others. What is the tone of your highest performing content? Is it light and cheerful? Is it serious and down to business? Are many of your posts celebratory? What kind of language seems to resonate most? Once you have an idea of what’s working, try some of these strategies on your own page. These patterns will help give you ideas when experimenting with your own content strategy. Or at least, they offer a great a place to start. So... feeling a little more at ease with your content plan? You'll be surprised how much this little bit of help can make a huge difference for the success of your page. Now go start searching for and sharing great content! Sign up for Free and get started!